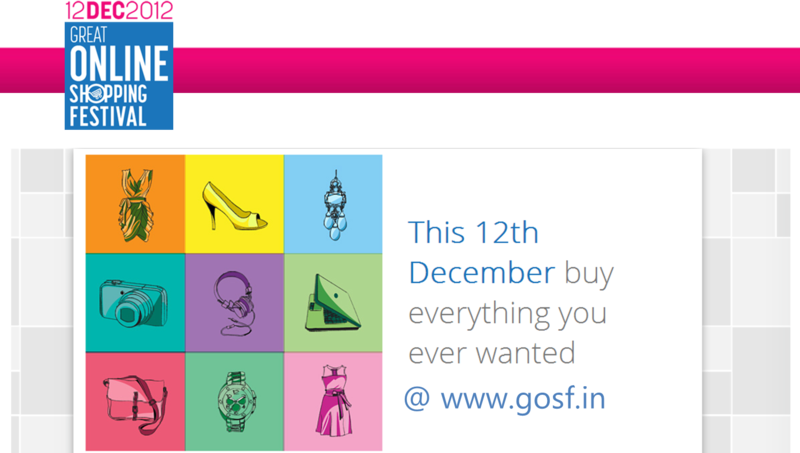 Official Google India Blog: India, shop your heart out at the ‘Great Online Shopping Festival’ on 12-12-12! India, shop your heart out at the ‘Great Online Shopping Festival’ on 12-12-12! The ‘Great Online Shopping Festival’, a 24 hour mega shopping bonanza that promises you the best deals and discounts that you can find on the web on a single day. To make this happen, we have partnered with leading eCommerce players in the country to offer you unbeatable deals and discounts that you can find on the web on a single day. The festival will see participation from over 50 partners including leading eCommerce, local & classified, online travel sites and BFSI industry offering their best deals to customers all across India for 24 hours. You can shop for everything from jewelry, shoes, apparel, travel packages, books, kids wear, gadgets, watches, computer accessories, health & fitness equipment, home decor products, avail of great deals on real estate and many more. Never shopped online before? We’ve got that covered for you as well. Check out our website www.gosf.in for some great tips and tricks for first time shoppers and learn a little more about online shopping, various methods of payments and how safe and convenient it is to shop online. Did we forget to mention that as part of this festival, some of our partners are also offering free shipping across India! That’s not all. The participating companies will also be offering special deals for first time buyers on their websites. We are excited to be part of this Industry wide initiative that is being organized for the first time at this scale to benefit over 137 million Internet users in the country and hope this will open the doors to many more! The clock is ticking, get your shopping list ready as we prepare to offer you a great online shopping experience with all our partners. There is one thing almost everyone loves...a good bargain. And we’re bringing the best deals and discounts on the web just for you! What are we talking about?